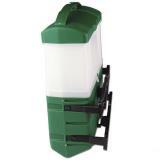 This poultry feeder can be fixed to almost any stable vertical surface. Includes 1 silo extender. To increase feeder capacity, add an additional Silo Extender. For feeding all types of poultry. Mounting can be on either a fence post, coop wall or tree. Feeder comes with brackets allowing it to be mounted easily, also making removal simple for cleaning or relocation. Comes with 1 silo extender. To increase feeder capacity, add an additional Silo Extender. Includes rain hood and mounting hardware. Suitable for pellets, wheat, barley and maize. Discourages the scratching out of feed. 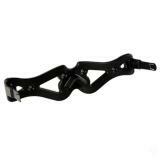 Simply attach the included bracket to the vertical surface of your choice. Attach the feeder to the bracket by sliding and clipping the arms into place. Ideal height: 6-10 inches off the ground. Includes installation hardware: Screws for rain hood and mounting bracket. 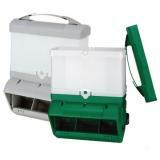 Allows users to increase feed capacity of their Wise Cage Feeder or Wise Mountable Feeder as their flock grows. Number of reviews: 23 customers reviewed this product. Recommended: 19 out of 23 said they would recommend this product to a friend. Love the product once it’s completed but mine it didn’t arrive with the screws to attach to my run or to put the bird protector on. 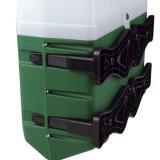 The Wise Mountable Feeder is awesome! I have tried a variety of other chicken feeders and none kept feed from spilling out when the hens pecked the pellets we give them. What a waste. 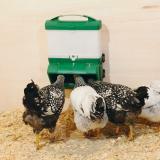 Not so with the Wise Mountable Feeder—the pellets remain in the feed tray when the hens access their feed. No more waste! And no more feed on the ground to attract mice! Yea! I use this with ducks and they will quickly remove the rain hood and the feed gets wet. I tie this to a tree to keep it upright on uneven ground and the second hopper ended up with a gap so water gets in. I eventually stopped using the second hopper as without it 2 scoops of feed fill the one hopper and that is enough for a days worth of feed. I would consider this to be "user error" so if you followed the instructions you probably would not have this issue, but if you are like me this could be the result. In the winter I just prop it up and it stays upright when it is full, but periodically they will tip it over when there isn't much feed left. I've had this for almost 2 years and it will last a long time, it is a quality product. At some point one of the screws inside (feed rate adjuster) full off and I think one of my ducks ate it so check to make sure it is tightened-I did not think to do this. If you use it with waterfowl please check this. If this is what she ate the result was not good. I would not buy this again for a second duck pen but I will continue to use the one I have. It would probably work just fine for chickens/birds not so orally fixated. I'm going to give it 4 stars because most people will be considering this for chickens. For ducks I would give it 3 stars. I am not recommending it as a duck owner as it is fairly pricey for what it is. Sometimes when I read product reviews on line,I’m struck that some poor folks simply have no idea how dumb they may be. Such is the case with this product. Complaints about no template provided to mark for screws: first, there is a template,well presented right in the body of instructions, awaiting the use of simple hand scizors; for those who never read the instructions, it isn’t too tough to take off the restraining bracket, hold it up to the area for mounting and mark the drill holes. This does not require an engineering degree. A second complaint about the top canister slipping off easily. I can only guess that this came from trying to carry the unit, perhaps filled, by the top cover handle. It is not meant to be carried that way, but to be filled in position after you easily remove the top cover by the handle. Beyond being surprised by these comments, it assembles easily, and most importantly it is quickly accepted by the flock and works as intended. Poor quality. Much smaller than expected. Plastic was warped. Not worth the high price. I would not even give it one star rating but the rating system would not allow zero stars.